We are living in 21st century a world of social network. Social network has taken its own place in everyone’s live, it allows to share things publically as well as privately depending upon the user. One of the most popular & crazy social network is Instagram. Instagram is an internet based photo & video sharing application. It allows registered user to upload videos & photos to the service. User can apply various digital filters to their images & add location through geotags. The posts can be designed with the help of hashtags to feature the content. Hashtags (#) often used to highlight the special meaning. It allows users to find all the post of specific theme or content. In blogging & at social network sites hashtags can be inserted anywhere within the sentence. Hashtags intended for discussions of a particular event tend to use an obscure wording to avoid being caught up with generic conversation on similar subjects such as chocolate festival using #chocolatefestival rather than #chocolate. 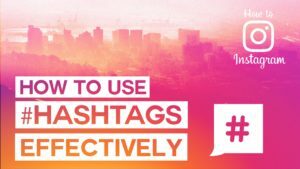 Hashtags are also used informally to express context around a given message with no intent to categorize the message for later searching, sharing or other reasons. Instagram hashtags are the easiest way to promote instagram account growth. Hashtags attract audience’s attention towards the post. The hashtags help organize & categorize photos and videos content which aids the process of content discovery & optimization. Find out what hashtags your audience is using & what fits to your content that you are publishing. Throwing random hashtags to post doesn’t help in instagram account growth. It is always a smart & learning way to know what your competitor is using in hashtags. In this way can learn more and more ideas and collaboration of both can lead to growth of instagram account growth. Surveying related hashtags or trendy hashtags is an easy & effective way to grow. Simply type your content hashtag onto app search bar & select closely related tags from the drop down menu. You can also select already trending hashtags. Like for fashion related content use #fashiongram or #instafashion. At least use 3-5 big hashtags on your post. Like for food blog use hashtags like #foodoftheday, #foodgram, #foodgasm, #foodie, #loveforfood. Hope these points help you in raising your Instagram account growth. Enjoy sharing videos & photos.